Divide your field down the middle as shown, split your players into two teams and have half of the line up at the centre cone (yellow cone) and the other half line up on the centre of the touchline. You should also create a shooting zone (about 5 yards) from Each goal. 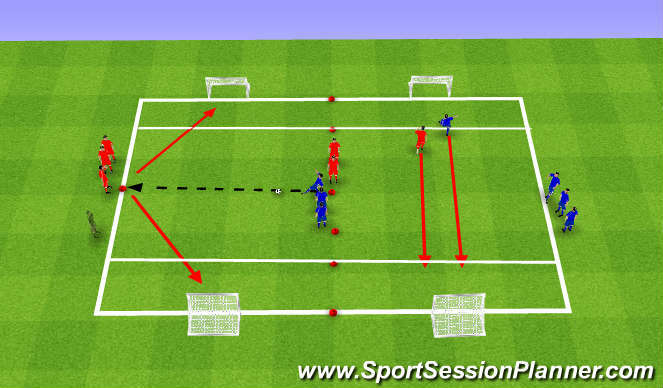 Once a goal is scored or a ball goes out bounds a sprint to the opposite shooting line occurs, the next player in line passes the ball across and moves out to defend once the sprint has taken place. 2 points for a goal, 1 point for the sprint.